We are in a time in history when the population of refugees and forced displaced people has perhaps never been larger. This, along with frustrating political stalemates regarding the root causes of humanitarian crises, suggests refugee resettlement as one salient way to reduce human suffering around the world. In the world’s top (3rd country) refugee receiving countries, however, public perception and nationalistic backlashes complicate this objective. Some of this backlash* is caused by the perception that refugees are a drain on public resources and largely subsist on welfare. Despite evidence showing that (on average) refugees pay more in taxes than they receive in benefits, it is true that many refugees struggle to find long-term employment opportunities upon arriving in the United States. Additionally, employment opportunities vary quite a bit depending on where in the United States a refugee is resettled. The figure below shows the percent of refugees employed in 43 resettlement locations across the United States. A new paper, published in the journal Science, aims to improve the method of resettling refugees across the United States with the goal of improving refugee integration into the economy (and society). The paper, by a team of researchers from Stanford and Dartmouth, entitled, “Improving refugee integration through data-driven algorithmic assignment” applies machine learning methods to predict where a refugee with a given set of characteristics is most likely to succeed in the labor market and economy. This is an interesting approach. I’ve written previously about the challenge of gathering information about a particular refugee’s geographic preferences before they are resettled. There are a host of barriers including: information asymmetries, references dependence, or simply unknown preferences. The machine learning approach basically uses all the information available about a refugee’s characteristics and uses it to predict where a refugee (or a family) is most likely to find employment within the first 90 days after resettlement. The figure in panel (A) shows the cumulative distribution functions for the actual (e.g. status quo) assignment and resettlement methodology and the algorithmic (e.g. machine learning) methodology. Remember cumulative distribution functions with a “lower” line represent a distribution that has a higher mean than a cumulative distribution function with a “higher” line. The figure in panel (B) shows the difference between the probability of employment, between the two methods, in various resettlement locations. 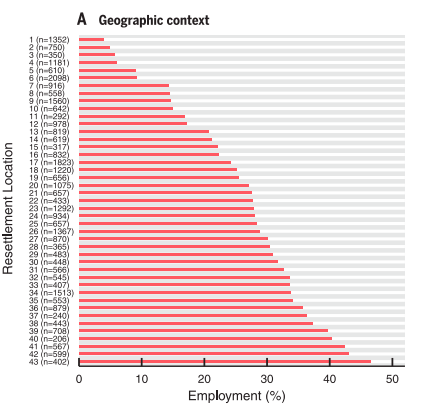 The key insight is the machine learning method leads to higher probability of employment in most locations, and in many locations this difference is quite large. The authors state the following, “This approach can provide governments with a practical and cost-efficient policy tool that can be immediately implemented within existing institutional structures”. I’m not so sure. The United States Refugee Act explicitly states that refugee assignment and resettlement effectively “spread the burden” of refugees across the United States. So, it strikes me that before instituting a method like this, the United States would need to adjust some of the existing institutional structures pertaining to refugee resettlement. Given the recent work by Evans and Fitzgerald (2017) I’d say this idea of refugees as a burden, although seemingly popular, is empirically unfounded. So, my take is we (the United States) should rewrite the Refugee Act and make (at least) two adjustments: (a) get rid of the “spread the burden” clause, and (b) improve the assignment and resettlement method, perhaps to a method that uses machine learning techniques. This would increase the probability a refugee finds employment upon resettlement, reduce the perception that refugees subsist on welfare (maybe), reduce human suffering around the world, and be a fiscal “win” for the United States. *Another component of this backlash is almost certainly racism. Unfortunately, no amount of machine learning and big data will solve this problem.